Chip Kelly always knew it would be tough to draft Marcus Mariota, even before he won the Heisman Trophy, led the Oregon Ducks to the National Championship Game and killed it at the NFL Combine. It didn’t dissuade anybody that Oregon lost the national title to Ohio State, or that Mariota’s pro day wasn’t nearly as good as his combine. If Mariota’s lack of experience with the pro game influenced anyone, it was Tampa Bay. The Bucs took Jameis Winston first despite his off-field troubles and Winston’s loss to Mariota in the Rose Bowl. Shortly afterward, Tennessee rejected trade offers from Cleveland, Chicago and Philadelphia to grab Mariota No. 2 overall. Kelly denied that after the draft, perhaps to avoid insulting those players, but in the end it didn’t matter, because the Titans had settled on Mariota before all of the trade offers came rolling in. How do we know? Because they had a giant pile of Hawaiian leis (those necklaces made of flowers) on hand to give to fans. It’s a tough break for Mariota, aside from the big payday being selected No. 2 overall guarantees him. Tennessee is a bad team, which is of course why they drafted second. My biggest worry is that Tennessee’s OL is terrible in pass protection, and Mariota’s going to need to pass a lot. Hopefully, someone will start teaching him how to get sacked safely ASAP. If he stays healthy and Tennessee stays bad, the Eagles may be able to trade for him in a couple of years when the Tennessee coach gets fired and people realize Mariota is better in Chip Kelly’s system. Four offensive linemen were taken by top 12 teams, including the Eagles’ division rivals in Washington and New York. Philadelphia getting eight sacks and 10 tackles for loss in its first game against the Giants last might well have entered into those decisions. This was Chip Kelly’s first draft as GM. Fans in Philadelphia are bitterly disappointed that he didn’t get Marcus Mariota, but he promised he wouldn’t mortgage the future for one player, and he didn’t. Chip doesn’t need an elite QB. It’s worth remembering 2010, when he took the Ducks to the national championship game in just his second year ever as head coach. Who was his quarterback? Darron Thomas — who can’t even start in the Arena Football League. Sam Bradford is a major injury risk, but he’s a clear upgrade at quarterback over Foles in passing accuracy, arm strength, and getting the ball out quickly. His production has been disappointing, but he has not had a decent offensive line or receiver in his five years in the league. He’ll never be a dual threat, but he played in a spread offense in college and can read and get the ball out quickly. He could be substantially better than the 2013 version of Nick Foles, and Foles was great in Chip’s offense that year. What if Bradford gets injured? That could easily happen, after two ACL tears on the same knee in two years. I think Kelly has a plan for that, too. He signed Ryan Mathews even after he had DeMarco Murray and Darren Sproles. A strong running game is the best quarterback insurance you can get. Sanchez throws way too many interceptions, and he’s maddeningly reluctant to keep the ball on read option plays, but he can hand off pretty well. When pick #20 came rolling around after seven eternities, Kelly might have traded down — most of the players slotted for the Birds were still on the board, so moving down five slots for an extra pick would have left them with someone they liked a lot. Chip said afterwards that they had 3-4 offers to do so. 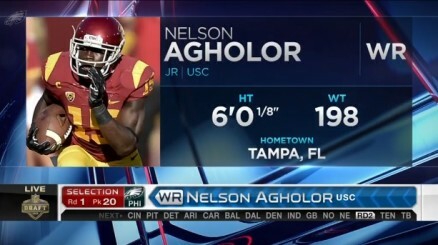 But instead, Kelly chose WR Nelson Agholor out of USC. This choice fit with several of Kelly’s noted tendencies, though Agholor is not a great blocking wide receiver and remains one semester short of graduating from college after three years. (Kelly really likes graduates, for both intelligence and the tendency to complete projects). 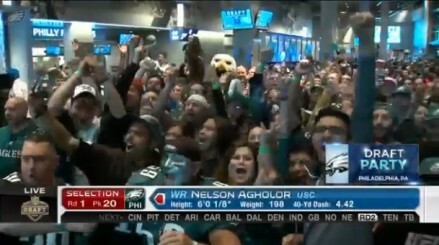 But Agholor is from the PAC-12, like fully half of Chip’s draft picks so far. And like many of Chip’s picks, he had a big game against Kelly’s Ducks — six catches for 162 yards and a touchdown as a freshman. In fact, Kelly told reporters that he had recruited Agholor in high school for the Ducks. Agholor is also versatile, playing all 3 receiver positions, and is amazingly similar in his measurables to a receiver the Eagles just lost to free agency. By coincidence, the Eagles’ last first round WR pick? Jeremy Maclin. Agholor was prolific at USC. No one knows what the Eagles will do next. No one would be surprised if Kelly tried some speculative pick lower down, such as La’el Collins who dropped from a solid first round projection after his ex-girlfriend was shot and police asked to talk with him. Obviously, everyone’s doing rapid investigation of that situation but police say he’s not a suspect. If Chip is confident there’s no bad news there, he could be an excellent value for the Eagles gap at offensive guard. Chip Kelly has always been a fascinating mix of bold, exciting risk taker and careful, methodical risk minimizer. In round one, his careful side was on display. We’ll know how well Chip maintains that balance on Saturday, after the next six rounds of the draft are completed.